Original Content: How About A Merry Christmas Post, Gail? Maybe One About Books? How About A Merry Christmas Post, Gail? Maybe One About Books? Why, yes, I can do that. Alex Waugh has a Christmas picture book round-up post at Randomly Reading. It's mainly 2017 titles with a couple of older ones tossed in. All those Christmas books reminded me of what may be my favorite Christmas picture book, published in 1993, Santa Calls by William Joyce. As a result, I am republishing a post from the Original Content archives all about about the splendors of this picture book for older child readers. Tomorrow night is Twelfth Night, if I've counted correctly, so I almost made it through Advent and the Christmas season without mentioning a Christmas book. However, on New Year's Day the family got into a discussion of the story line for The Polar Express by Chris Van Allsburg. After I checked at the library today, I discovered that the others at the table were right, and I was totally wrong in my recollection of the book. Why am I bothering to blog about my own inept memory? Because I was recalling a totally different book, one I love and want to direct some attention to. 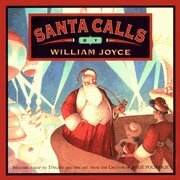 Santa Calls by William Joyce is not your traditional Christmas tale in which a passive child protagonist experiences the North Pole or Santa or the mysterious spirit of Christmas through the intervention of adult characters. No way, Jose. Santa Calls is a Tom Swift type adventure in which the action is initiated by a child (though we don't know that right away) and undertaken by children. Yes, Santa and his very nonstereotypical assistants are there watching over everyone. But it's a kid who comes up with the candy bomb! The kids resolve the action. The story is about the kids, not the adults. That's what kids' books are supposed to be, by the way. Santa Calls doesn't trot out that tired old Christmas theme about childhood being a magical time that is lost when the child grows up, either. Instead, Joyce suggests that real relationships and real happiness in this moment right now are gifts, too. Why am I now able to recall so much about Santa Calls when just a few days ago I had it confused with The Polar Express? Because while I had to go to the library to refresh my memory on The Polar Express, I was able to just pull my copy of Santa Calls off my bookshelf. Rereading it on the Eleventh Day of Christmas was a real treat. Merry Christmas, Gail! Thank you for your blog. I read every post and greatly appreciate your efforts. Thank you so much, Cynthia. That's very flattering. And merry Christmas to you, too.